I’m 100% with H0rati0 here, it’s a load of rubbish and just an ar5e covering exercise to give companies ready made excuses not to honour warranties etc..if their products fail. If you can’t swim with 50m (I know you can, my Hamilton day/date has been in pools, rivers, ocean etc.. with me no problem) then there is no way a massive multi billion dollar company like Apple would have advertising campaigns specifically showing you that you can swim with their 50m rated Apple Watch. It was their main focus/selling point when that model came out. Interesting to note that 15ATM (150m) (the OP's watch) is 'safe for snorkelling in open water', whereas in AVO's table 200m-500m is needed for the same activity. Whereas in reality 5ATM would be fine for snorkelling if the watch is fit for purpose! I intend to swim with a watch fit for only 3ATM the next time I go. Mind you it will only have been a £9.99 experiment if it fails. I swam with F91W. For three years in a row. And little thingie is not even rated.. in any way.. Check the gaskets, simple 10 bar test at local watchmakers should do the trick. Enter the snowflakes wailing "but that is only static pressure, dynamic pressure is different". Rubbish, pressure is pressure. A small dynamic increase well within limit is irrelevant. Removing and reapplying FULL pressure suddenly to the limit would be a severe test but that is total disconnect from real world usage and even further from human corporeal limits. Finally and specifically, don't wail at me about arm movements when swimming, any dynamic pressure increase would not even reach trivial. 3 ATM (tested) is plenty more than enough for simple snorkelling (not Free Diving) just as 10ATM is more then enough for any SCUBA, except Tech which is a whole different (and order of magnitude more expensive) proposition. Any decent local watchmaker will do you 10ATM test for pocket change. ^^^^^ Nik I am on the same page as you regarding the nonsense often spouted about what WR is required for swimming, snorkelling or diving! I wouldn’t use one of my normal 30m WR watches, because the strap would get soggy and I also don’t tend to take them on that type of holiday. The 30m WR I had in mind was my F-91W and it was tongue in cheek, as I know that is ok, even though not rated. I normally wear one of those 100m Oyster cased things, because that is what I would have with me on holiday. I think that there are some folk who have been to about 60m wearing a 100m Oyster. Their is a definitive difference between static and dynamic pressure. Watches atm ratings are measured as static pressure. there is continued arguments as to how much difference (static v dynamic) is generated in the act of swimming as opposed to just having the watch underwater at a static pressure. I shall leave that to the scientists/engineers among us. I have heard and read the arguments both ways for many years. The use of the WR charts previously shown above, and the general use of them within the industry, is purposeful in that it does protect makers and give users a visual margin of error. I do not blame them for being cautious given such litigious societies these days. That said, I have never had any issues myself, with a rated 10 atm watch, for any water related activities. I would see no reason to doubt the usage of rating if tested on an annual basis and the crown is pushed firmly closed and/or screwed down. I also would not wear any watch in the shower or hot tub. ^^^^ Kip how much is the “definitive difference between static and dynamic pressure”? It is clearly possible for a scientist to calculate it, using different scenarios of arm velocity and from what I have previously read it has been calculated. IIRC (without doing an internet search) it’s about a 2% difference at approximately 100m. I.e. sitting at 100m waving ones arms as fast as humanly possible comes out at exerting pressure similar to being at about 102m. Given that any brand worth it’s salt tests to a greater depth than that allocated to the watch, it hardly seems an issue. 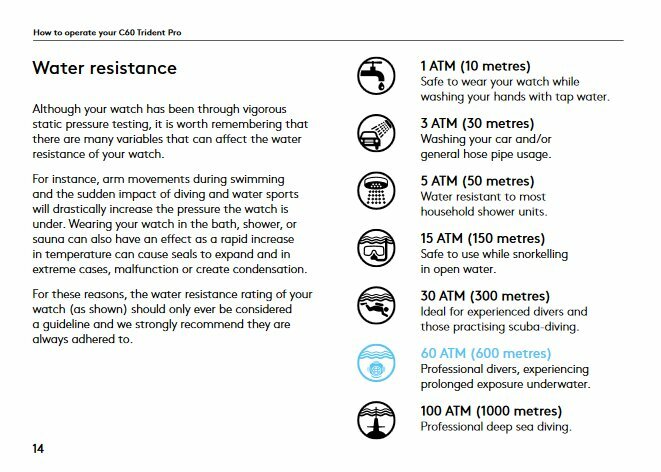 In addition watches with a rating of say 10ATM, 15ATM or even 20ATM are not marketed to anyone like commercial or saturation divers, with those likely to be the only folk going anywhere near those depths. So unfortunately it’s back to ratings ascribed to a watch being the province of a brands marketing department “higher rating infers better and more expensive” and the “suitability for use charts” the work of the brands legal department! Happy to read any articles or well reasoned posts anyone can find that state the difference between static and dynamic pressure is sufficient to warrant the need to build in such a margain to the “suitability for use charts”. Kip set me thinking about the dynamic pressure change on a watch while diving or swimming, so please indulge me a slightly technical example. A fast bowler ( I am talking cricket, but I imagine a baseball pitch would be very similar) can reach release speeds of 100 mph or so, ie 45m/s. If we assume that that is reached as 0-45m/s in 1 second to keep the numbers simple but pretty reasonable (discounting run up) we have an acceleration of 45m/s/s. Of course no way could anyone achieve this against water pressure, but bear with me. Now lets convert that force to a pressure in Pascals, assuming that force is applied just to the face area of the watch (again, extreme). The watch is 43mm diameter, giving an area (A=πrr) of 1520 sq mm or .00152 sq meters to keep our units strictly SI. Pressure = 9N/0.00152sqm = 5,921Pascals. But 1ATM = 101,325 Pascals. So this pressure which as you'll recall could only be generated by an exceptional athlete in open air is about .06 ATM or 60 cm of water pressure. Against the C65's 150m rating: trivial at most. Sorry Neal, we were obviously thinking along the same lines while our posts crossed. It took me a little while to wade through all that long forgotten stuff. Remember I said definitive and not significant. If I have read your analysis correctly you are comparing waving one's arms in the air and/or underwater. My sense is that you would create more dynamic pressure in the air as opposed to underwater given the resistance/density factor. What type of dynamic pressure do you think would be created by normal swimming? Whether significant or not,I would think this would be higher given the impact of ones wrist against the water. correct. One could not move one's arm at anything like the speed/acceleration I used underwater so the variations in pressure would be smaller. What type of dynamic pressure do you think would be created by normal swimming? Whether significant or not, I would think this would be higher given the impact of ones wrist against the water. I think that it would be in the same order of magnitude but caused by the sudden deceleration of immersion in the water, though still insignificant compared against the watch rating. Remember, the force I quoted is an extreme example but I think it pretty comparable to swimming pressure given the limits of what a human body could generate. One could also argue that I used too large an area (the watch face) over which to apply the force, though again I can not see that it makes a significant difference. But, Devil's advocate, even if we reduced the area 10X, the resulting pressure variation would still only be 0.6ATM or 6m water depth. Without ducking the issue one can bandy back and forth, but I intended the example to set context for the kind of pressures that could be generated compared to a watch's rating. Being a simple soul who is always befuddled by science, I wish the manufacturers would stop using ATM / metres / feet and putting a whole range of different interpretations on the same data. I would like a simple scale where 1 = "Don't even breathe on it"; 2 = "OK to wash the dishes" and so on up to..."Go swim round the Titanic - your watch will work but you won't". Basically, like the majority of people (I suspect) I want to know if I can go in a pool wearing it. How hard can it be? I hear you and that was the point of my (somewhat tedious, though for me a trip down memory lane) exercise. So long as we are talking reputable manufacturers who design and test, 100m rating means 100m depth and even a 30m rating is fine to swim with - though the strap should be suitable for immersion of course. From my own experience (100++ dives, swimming, waterskiing) and now theoretically, I'll stick my neck out in giving the assurance - with the sole proviso that the pressure test is current.